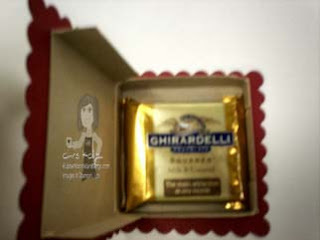 I have received a lot of emails asking for directions on how to make the little Ghiradelli chocolate box (you can see it HERE) that I posted on Tuesday. I will be making a video tutorial for you next week, so be sure to stop back by and check it out! USE YOUR CORNER PUNCH AND BORDER PUNCHES TOGETHER! I have had a number of customers asking how to use their border punches and corner punches together, so I decided to do a little video tutorial for you this week and show you a few little tricks that make it easier for me to get the perfect borders I want with these punches. It was a bit difficult to get good pictures/video of the punch, but I think if you watch the entire video you will have a great idea of how to use these punches together successfully. PLUS you'll get an idea of how to make a quick and easy gift tag! Thanks for stopping by the Rubber Room and watching this video. Be sure to stop back next Wednesday when I will have another creative video to share! On Saturday I will be attending a Stampin' Up! Demonstrator shoebox swap, and this is the project I will be takeing to share. I hope the gals like it :o) I used some Deck the Halls Designer Series Paper and the Scallop Squares Duo Bigz Die for the Big Shot. Both of these items can be found in the Stampin' Up! Holiday Mini Catalog. 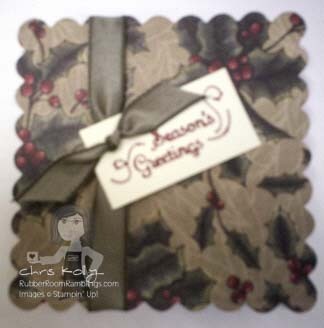 The little sentiment on the tag is from the Gifted stamp set and is tied on with some Taffeta Ribbon. When you open the box you can see a little candy treat! With the Designer Series Paper and the Bigz Die, this is a really quick and easy project to make, and with the chocolate treat inside, it's sure to put a smile on anyone's face this holiday season! It's time again for my Tuesday Card Club, where we make three cards from the same card pattern. Here is a little sneak peek at our pattern for this month, and one of the cards we'll be makeing. 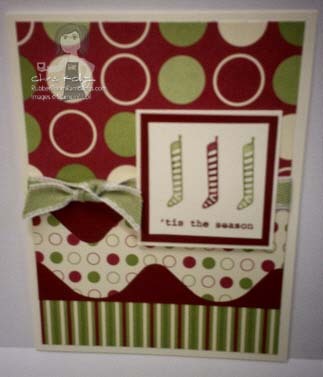 For this card I used the new Bigz XL Tasteful Trim Die, which is available in the Stampin' Up! Holiday Mini Catalog. I also used the Jolly Holiday Stampin' Up! 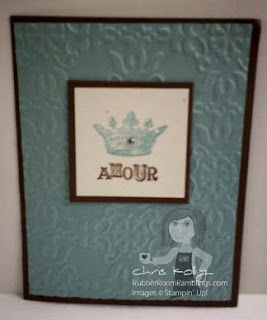 Designer Series Paper and the Gifted Stampin' Up! stamp set. I used my Cherry Cobbler marker and cardstock, along with my Old Olive marker. The markers were used to color my stamp; then I "huffed" the stamp to "re-moisten" my ink before stamping with it. I stamped my image onto Very Vanilla Cardstock. I finished it off with some Pear Pizzazz 1/2" stitched-poly ribbon. This is a great quick and easy holiday card to make! This little box was made with the Big Shot Box #2 Bigz XL Die and some Textured Real Red Cardstock. I used the Candy Cane Christmas Designer Fabric (available in the Stampin' Up! 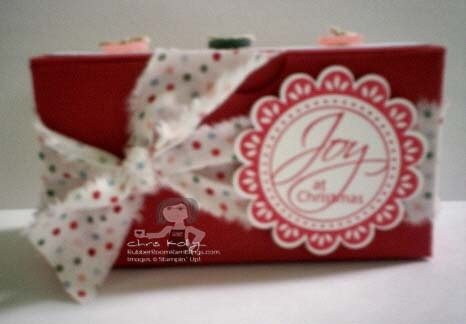 Holiday Mini Catalog) to tie a little bow on the front of the box. The sentiment comes from the Stampin' Up! Perfect Punches stamp set and was punched with the Stampin' Up! Scallop Circle Punch. On the top of the box I used a small piece of Candy Cane Christmas Designer Series Paper and some matching buttons. This is a great little box to fill with candy and give as a small gift. Do you remember one of the last scene's in the Wizard of Oz, where Dorothy and her pals had finally made it to see Oz and "The Great Oz" was speaking while Toto pulled the curtain open and then "The Great Oz" said, "Pay no attention to the man behind the curtain"? Well, I swear that's what happened to me today. I kept trying and trying to get my computer working so I could add this post to my blog, and there was little man inside this dang computer that kept saying "pay no attention to the crazy lady at the keyboard"! The good news, however, is that I persevered and am now able to treat you to this post at long last~~WOOOHOOO! 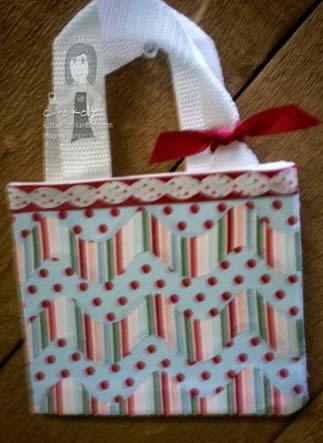 So, here is a picture of a little canvas tote that I covered with the new Candy Cane Christmas Designer Fabric, which is currently available in the Stampin' Up! Holiday Mini Catalog. I used the Tasteful Trim Bigs XL Die and some Big Shot Fabric Adhesive to put my bag together. Then I added a little 5/8" Real Red Satin Ribbon to the top of the bag and made a little bow on the handle with it too. Are you enjoying the Designer Fabric Stampin' Up! is offering in the Holiday Mini Catalog? If so, please leave me a comment below with a link to where we can see what you made! This is one of the cards we made at my Mini Catalog Open House last night. We used some Candy Cane Designer Series Paper with the Tasteful Trim Bigs XL Big Shot Die (both available in the Holiday Mini Catalog). 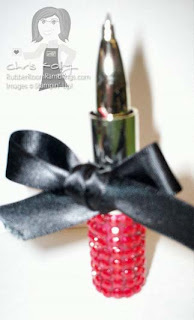 We also used some Real Red and Garden Green Cardstock, along with white Taffeta Ribbon. The stamp is from the Gifted Stampin' Up! Stamp Set, and we used our markers to add color to it. 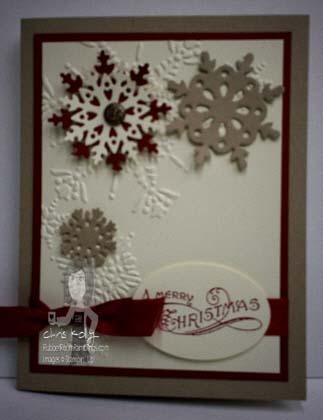 We also used the Square Lattice Embossing Folder for the Big Shot to add some texture to our background/card front. The glitter on the Designer Series Paper really adds lots of sparkle to our card! I am having difficulty getting my little video camera to work, so I won't be able to share a video with you today. Hopefully, I can get my son (the teenager with a little more electronic savvy than his mom ;o) to figure out what I'm doing wrong and get me back up and running! I will share a card with you, though, so you won't miss my video too much. Well, here you go, as promised, one more owl punch transformation. 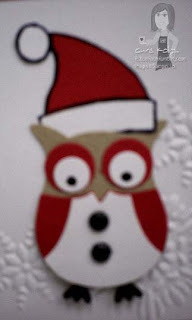 This little owl has been a ghost, a witch, a pirate, a bride, a groom..... now, he's a Santa too. Next I may have to try an elf???? Here is a little Pixie Stick treat for Halloween. The "ghoul" is made with the owl punch. I am telling you, that punch is a MUST HAVE!! It is just too dang fun! 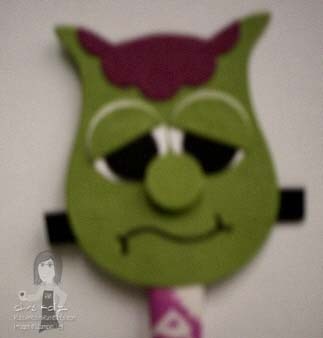 Stop back tomorrow and see how it takes on even one more different persona!! I love this card. You can bet it will be showing up in a Holiday Stamp-A-stack soon! Keri made this to share with us at our last demonstrator get together. She used lots of great products from the Occasions Mini Catalog! 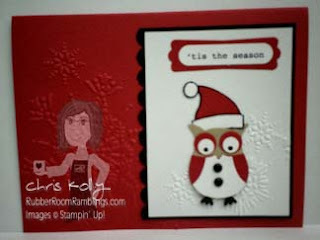 The sentiment is from the Bells & Boughs Stampin' Up! Stamp Set; the ribbon is the 1/2" Cherry Cobbler Seam Binding; the embossed snowflakes were made with the Northern Flurry Embossing Folder for the Big Shot; there's a Glimmer Basics Brad in one of the big snowflakes; and the diecut snowflakes were made from the Northern Frost Decorative Strip for your Big Shot. The Stampin' Up! Holiday Mini Catalog is full of even more wonderful products. If you don't have one, please contact me, and I will be happy to get one to you! BUT, I am going to make it up to you! Last Saturday the Stampin' Up! Demonstrator Group called Stampers At Heart had their quarterly meeting in Indiana. Sadly, I was unable to attend the meeting :o( However, my upline, Christina Proffer, surprised me by making swaps and swapping cards for me at the meeting. I must say that getting the mail out of my mailbox yesterday was way more fun than usual!! So, thanks to Christina and all the gals who swapped cards at the Stampers At Heart meeting last week, I will catch up on my past-due blog posts and share their swaps with you. Enjoy all their creativity! 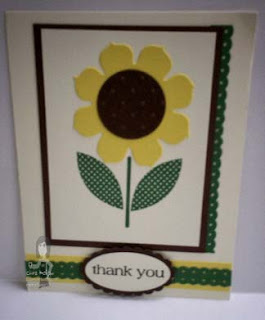 To start us off on our little Stampers At Heart swap card share, is the swap card made by Pam Logan. For her card she used the Blossom Party Big Shot Die as her focal point. 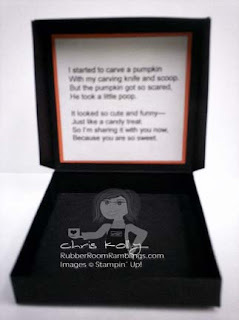 She also used the Stampin' Up! Scallop Ribbon and Scallop Oval and Large Scallop Oval Punches. Her Card Stock is Garden Green, Daffodil Delight, Chocolate Chip and Very Vanilla. This is Karen Waterman's swap card. she used Basic Gray Cardstock and Classic Ink, along with the Stampin' Up! Eyelet Border Punch, Word Window Punch and Large Oval Punch. Her sentiment is from the Stampin' Up! Stamp Set called Teeny Tiny Wishes and the flower stamp is from the Stampin' Up! Stamp Set called Elements of Style. Here is a swap card made by Sue Myers. For this card she used the Just Believe Stampin' Up! stamp set; Soft Suede, Crumb Cake, Very Vanilla, and Old Olive Card Stock and Soft Suede Ink. To "accessorize" her card she used Metallic brads, Old Olive Ribbon, the Square Lattice Embossing Folder for the Big Shot the Stampin' Up! Two-Step Bird Punch and her Mat Pack and Paper-Piercing Tool. 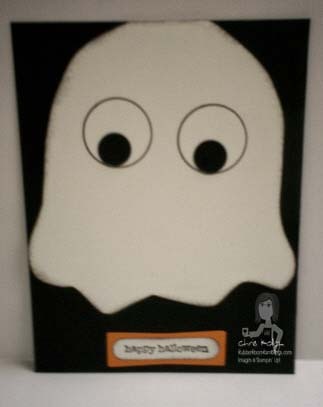 This swap card was made by Kelly Mathews. You can find the instructions on her blog HERE.. She even gives you a template for her ghost! This is the swap card Christina Proffer made. 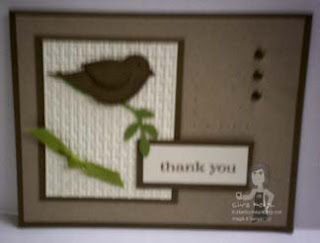 For her card she used the Artistic Etchings Stampin' Up! stamp set, Chocolate Chip, Baja Breeze and Whisper White Card Stock with Baja Breeze and Chocolate Chip Classic Ink. To "accessorize" she used the Vintage Wallpaper Embossing Folder for the Big Shot and Basic Rhinestone Jewels. This is Cindy Kemna's swap. 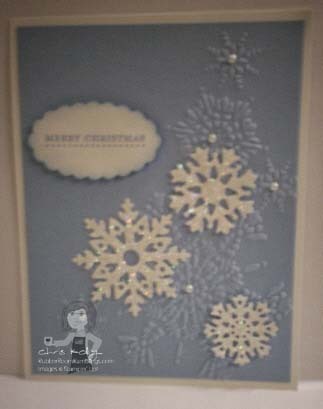 She used the Northern Flurries Embossing Folder for the Big Shot and the Northern Frost Decorative Strip Die for the Big Shot, along with the Teeny Tiny Wishes Stampn' Up! stamp set, Pearl Jewels, Scallop Oval Punch, Dazzling Diamonds Glitter and Bashful Blue Card Stock. 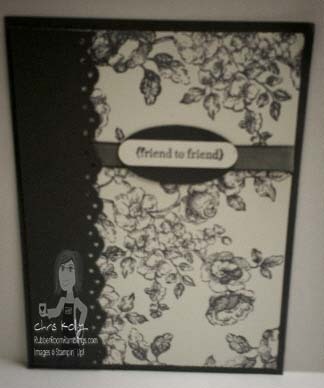 Here is the card Keri Blake shared with us at our demonstrator get together. She used the Stampin' Up! Broadsheet Alphabet to spell out "noel". 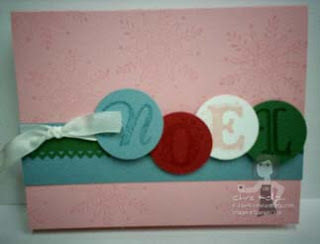 This is a quick and easy card that will surely turn up in one of my Holiday Stamp-A-Stack classes. Thanks for the great idea, Keri! This is Nancy's card from our demonstrator get together. I love the fall color combination! 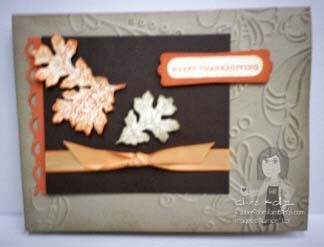 She used the leaf from the Lovely As A Tree stamp set, and it is so perfect for this time of year. Thanks so much, Nancy, for your creative inspiration! This is another little treat Michelle shared with us at our demonstrator get together. She used a Sissix Big Shot Die to make her pumpkin face. Here is Michelle's box open. There is a little "pumpkin poop" poem attached inside the top/lid of the box, and plenty of room to stick a little package of candy corn inside the box. This is adorable! Thanks for shareing it, Michelle. At our demonstrator get together on Thursday, Michelle made two awesome little boxes for us. This is the first one. She embossed the top with the new Web Embossing Folder for your Big Shot. 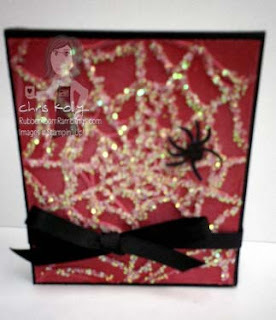 Then she added some chunky glitter and a cute little spider that she stamped and then cut out. Here is a picture of her box opened up. 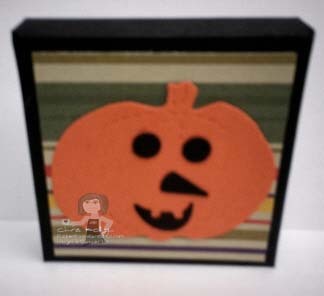 The image she stamped on the top is from the Dark and Dreary Stamp Set, which is available in the Stampin' Up! Occasions Mini Catalog. Inside her box she has put a little container of anti-bacterial soap. It is so cute, it's called "Spider's Web" and is licorice scented. She purchased it at Bath and Bodyworks. 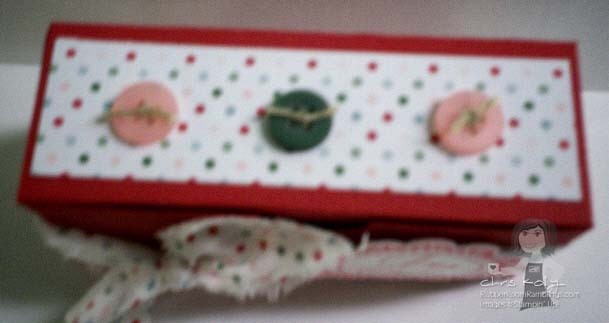 Thanks for shareing this cute little soap holder with us, Michelle. I know I'm going to have to make some of these for gifts now! I have been missing my friend, Michelle, this summer. She likes to camp and with all the time I've been spending at "The Resort" we haven't had much time to visit and play. Finally yesterday I was able to get together with some of my demonstrator friends, and we had a great time! I will be showing you lots of things we made over the next few days, so be certain to stop back by. Michelle came in with a gift, that I just love and have to share. She made these great little "compacts with lipstick" which are really a pen and a sticky notepad holder. They are so cute!! Here they are all closed up. Here is the "compact" open. Michelle put some silver paper on the top so it would look like a mirror. 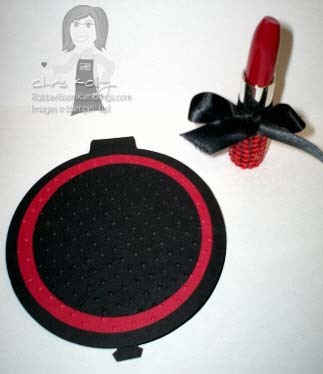 The round pad on the bottom is an actually sticky notepad that she's stamped words on! Here is the "lipstick" open. Now, is that a shocker? Yep, it is a pen that you can write on your sticky notepad with! THANKS SO MUCH, MICHELLE~~I LOVE IT! !